Thaksin Shinawatra sprays water towards supporters in front of Angkor Wat temple in Siem Reap, April 15, 2012. 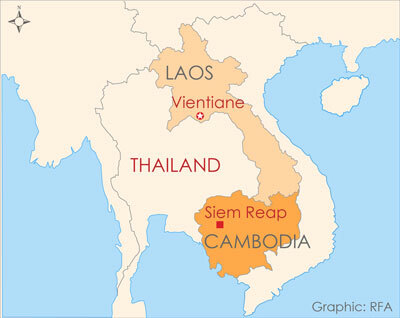 Cambodia’s hosting of a mass rally at the weekend for ousted Thai premier Thaksin Shinawatra may result in warmer ties between governments of the two countries but has also raised questions of Phnom Penh’s interference in the internal politics of a neighboring country, experts say. The fugitive Thaksin on Saturday addressed thousands of his "Red Shirt" supporters, who streamed across the border from Thailand to Cambodia’s northwestern Siem Reap province in the first major rally he has attended since being toppled from power in a military coup in 2006. Cambodian Prime Minister Hun Sen welcomed Thaksin’s supporters into the country, ordering immigration officials to provide “special treatment” to the visitors and waiving their fees for entry to the ancient Angkor Wat temple complex near Siem Reap. Independent analyst Sok Touch said Hun Sen’s move could mend ties with Thailand following several military skirmishes near a shared border area last year. The two countries traded heavy arms fire over a disputed border in early 2011 under the previous Thai government, but ties have warmed significantly since Thaksin’s sister Yingluck came to power later that year after her party ousted the then Democrat Party-led government. Chheang Vannarith, executive director of the Cambodian Institute for Cooperation and Peace, said the arrival of Thaksin and the Red Shirts in Cambodia demonstrated better relations between the two countries and their people. “Not only Cambodia, but other countries, such as Laos, Burma and Malaysia—all of these four countries surrounding Thailand have opened their doors to welcome him,” he said. The 62-year-old Thaksin was toppled by royalist military generals in 2006 and lives in Dubai to avoid a two-year prison sentence for corruption that he contends is politically motivated. By hosting and lending support to the weekend rallies, Cambodia was interfering in Thailand’s internal affairs, another Cambodian analyst, Lao Mong Hay, said. Thaksin received a similar welcome from Lao authorities. He has now visited four of Thailand’s neighbors, including Burma and Malaysia, since the beginning of the year. Thaksin told his supporters over the weekend that he hopes to return on his own terms to Thailand in 2012, which he called an “auspicious year” for Thailand—currently celebrating Songkran, or Thai New Year. Thaksin’s sister refused to comment on his plan to return to the country at a press briefing in Bangkok Monday. Thaksin is Thailand’s most controversial politician. After fleeing Thailand, he lent his support to the Red Shirt movement to counter the Yellow Shirt Royalist group whose street demonstrations led to his ouster in 2006. He then backed Red Shirt rioting in 2009 against the anti-Thaksin government led by the Democrat Party and encouraged street demonstrations in Bangkok which led to the worst political violence in decades, with 91 people killed over two months. Thaksin has been accused of mixing business with politics and of an intolerance of criticism, but many Thais believe the first-ever politician to serve a full term as prime minister was removed from office because he posed a threat to Thailand’s powerful military and royalist power base. Yingluck’s government is in the process of removing obstacles to Thaksin’s return, including the proposal of changes to a military-backed post-coup constitution which weakened Thailand’s political parties and legislation that would grant an amnesty to participants in the last six years of political turmoil. Thaksin’s opponents fear that he would run for office upon his return to Thailand and seek revenge against his political enemies. Analysts say they are likely working to forge an agreement granting the army and monarch protection in exchange for the lifting of charges against him. But many say that with his growing support in Thailand, time may be running out for the royalists. Any thing happen against Thai Monarchy Thai Militar will take action against criminial offence.